No more need to remember a lock combination. The Quicklock uses keyless technology to unlock your bike, shed, or anything else. Use the app or, if you’re not a smartphone user, the package includes a fob and two credit card-sized keys. The Quicklock padlock is so easy to use and baffles people when they see it unlocked. Just a great padlock and no key to lose! Is there anyone who hasn’t forgotten a combination lock code? Luckily, Quicklock has come to the rescue. This innovative padlock opens with your smartphone (via Bluetooth), a fob, or a key card. 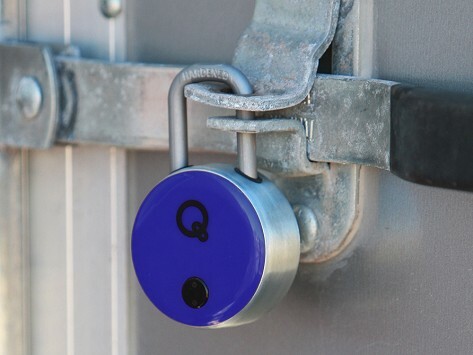 Use Quicklock on a shed or a fence or to lock up your bike or to use as a locker at school or the gym. Made with die-cast zinc alloy, it’s durable and weather-resistant.The rechargeable battery lasts for up to two years, too (depending on how often you use it). Unlocking via the app is so simple. Press a button on Quicklock—the app syncs up to your phone. Just press "Unlock" on your screen. Click―the lock opens. Not a smartphone user? Quicklock works for you, too. It includes two credit card-shaped keys and a fob that use NFC (Near Field Communication). Hold one near the lock and it opens. No more combinations or keys—enjoy the security and simplicity of Quicklock.